NORTH EASTON, Mass. 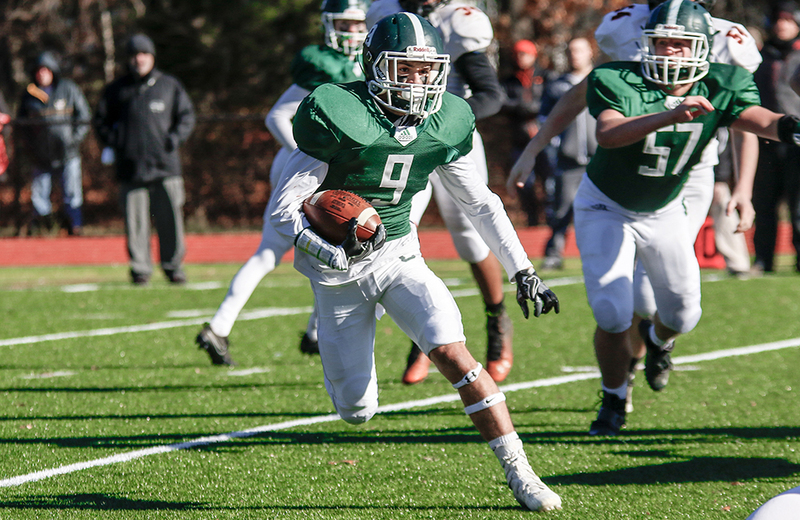 – When the final whistle sounded at Stonehill College’s WB Mason Stadium, Milford had no idea whether or not it had done enough to secure a spot in the Div. 3 South playoffs but Hawks coach Anthony Vizakis was sure that they had done all they could on Friday night. Milford closed out its regular season with a come from behind, 18-15 win at division rival Stoughton in a game that felt like the postseason for both teams. At the start of the night, unofficially, the Black Knights held the final spot in the South bracket with Milford a spot behind and now both teams will have to wait and see how this result impacts the MIAA’s formula. For the Hawks, it is a third straight win after losing the opening four games of the season. Senior Brendan White, who scored a touchdown, intercepted a pass, and recovered a fumble against the Black Knights, admitted that Friday’s win meant a lot to the upperclassmen. Milford knew it needed a win to have any shot at the postseason and the Hawks had several opportunities to get off to a great start and take the lead in the first half. Shapel Feaster intercepted John Burke on third down on Stoughton’s first possession, returning it to the Black Knights 33. But the Hawks failed to take advantage. Four plays later, Colby Pires’ fourth down pass to Brendan White fell incomplete and the hosts took back over. Stoughton was held without a first down on its first three possessions, while the Hawks drove into Black Knights territory on each of the first three times they had the ball. Each time, Milford saw its drive stall, including a touchdown that was called back due to a block in the back penalty. On the third drive, Sean Lehane (four catches, 70 yards) lined up a 42-yard field goal attempt. The Black Knights blocked the kick with enough force that it ricocheted all the way to the Milford 30 where Christian Georges pounced on it. Despite having only 13 yards of offense to that point, Stoughton found itself with a chance to take the lead. On third and seven, Burke (9-16, 111 yards) rolled out to the near sideline and he found Alex Iverson open. The senior running back turned and bowled his way through a couple of would-be tacklers for a 26-yard touchdown and a 7-0 lead. It was the one of only two first downs that Stoughton would get in the first half. The Hawks needed a spark and finally put together a complete drive right before halftime. Pires (13-22, 183 yards) hit Hugo Lopes for a 30-yard gain to get things started. He then connected with Lehane on a bubble screen for 40 yards down to the one, where Jeff Grier hustled to make the touchdown-saving tackle. On the next play, Pires found Feaster wide open for the touchdown. The extra point was blocked and Stoughton went into the break ahead 7-6. The Hawks started the third quarter by driving into Stoughton territory but were forced to punt. 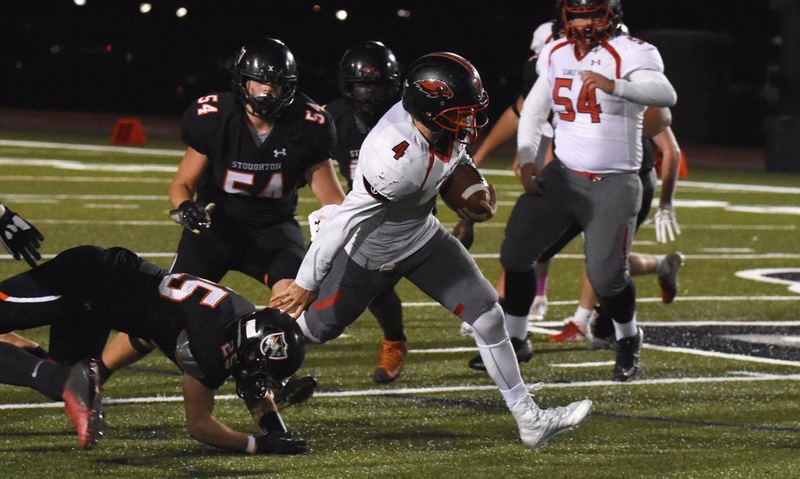 The Black Knights finally looked to get something going on offense when Burke was able to find Iverson, despite being hit by Josh Ligor, for a 28-yard gain. On fourth down, Burke’s pass was picked off by White to end the drive. After another Milford punt, Stoughton turned the ball over for the third time. Again it was White that made the play, diving in to recover a botched hand-off at the Black Knights 19. Three plays later, Pires slipped a pass to White underneath the coverage and he dove into the end zone for Milford’s first lead, 12-7. 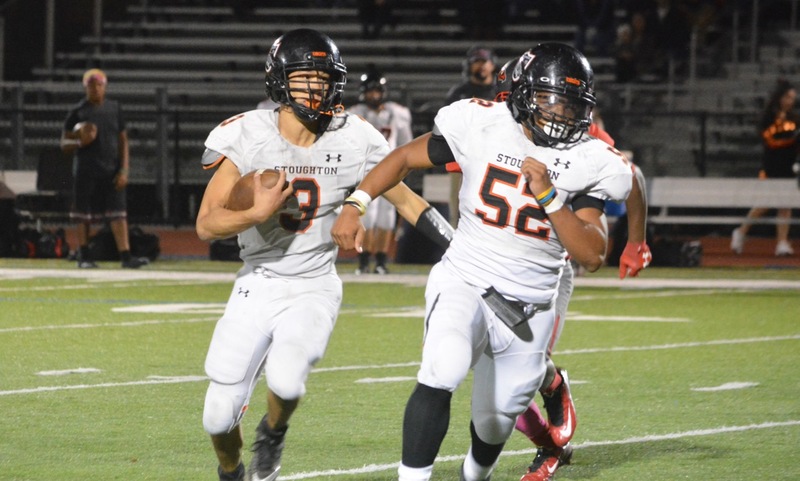 Trailing for the first time on the night, Stoughton put together its best drive. The Black Knights marched 75 yards on 10 plays, mixing up the run and pass and getting Burke outside the pocket. Grier (11 carries, 56 yards) got it going with a 20 yard sweep and a pass interference call on a third down bomb helped keep the drive alive. Christopher Ais would give Stoughton back the lead when he found a seam on the left side and scored from 12 yards out. Burke rolled to the near sideline and threw a strike to Malachi Green-Hightower, who just managed to keep his feet inbounds, for the two-point conversion and a 15-12 lead with 5:20 to play. The Milford offense had been struggling at the start of the season, but scored 40-plus points in each of its last two games and seemed to have turned a corner. The offense came through again in the fourth quarter, going 64 yards on seven plays in just under four minutes to earn the victory. Lucas Rosa (13 carries, 63 yards) had a run of 14 to get the ball to midfield and then Pires went deep to Feaster for 27 yards on the right sideline. After Rosa went 21 yards on two carries, Milford had the ball at the one. Ryan Pearl came off the bench and ran two sneaks to get the ball across for the score. Stoughton had 1:40 left to try and salvage the win. On third and six from his own 33, Burke looked deep down the sideline to Ajahn Rue and the junior receiver went up with Feaster. Both players came down with the ball, but the Milford defensive back ripped possession away, earning his second interception of the night and sealing the win. Milford (3-4, 3-2) and Stoughton (3-4, 2-3) will now wait and see how the playoff standings work out. The MIAA will announce its official brackets this weekend.